Preferably age 12 and up, but I will consider younger if you think they will be fine with operating a machine on their own, or you are welcome to accompany them to help also. Machines provided. I would like everyone to use my machines to start with, but if they have one of their own, I’ll get them using that by the end. Materials and supplies will mostly be provided, but students can bring their own if they want for a particular project. We will be learning the basics of operating a sewing machine, and making several projects throughout the class. These may or may not include those pictured below, it will depend on interest and how things go. Please register for the class you would like by clicking 'add to cart'. If if you are enrolled with Idea, Raven, or CyberLynx and wish me to bill them for you, please enter $0. If you are enrolled with BEST, or are independent, or want to be reimbursed, please enter $395 in the price field. Let me know if that's confusing, trying to accommodate everyone! Also, for any of these classes, if you have a group of 3-6 friends who want to take it, I will work on finding a time that works for you! In this class we will make one of my quilted greeting card designs. These four come in kit form, but there are others that are pattern only that you could choose from also. These panels by Robert Kaufman are so fun, and a great and low stress way to practice some free motion stitching. I will provide the panel, and you will have a choice of at least 16 designs. We will put the borders on and add some decorative free motion stitching on the panel. then finish quilting and binding. It's hard to see it all in the photo, stop in if you want to see the real sample! 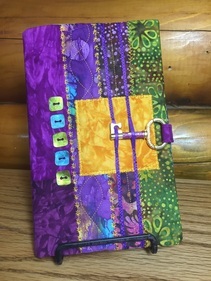 (click to enlarge photo also) You will need to bring fabric for borders, backing and binding, so you may want to pick up your panel in advance to match them. Grab a few friends and have a quilting party! This would be a great project for that. If you have a group of 3-6 people, I will work with you to find a good time to do it! 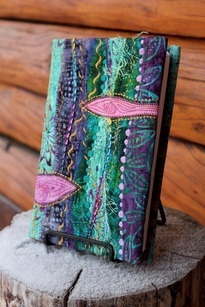 These are an easy and fun introduction to art quilting, lots of room to be creative! 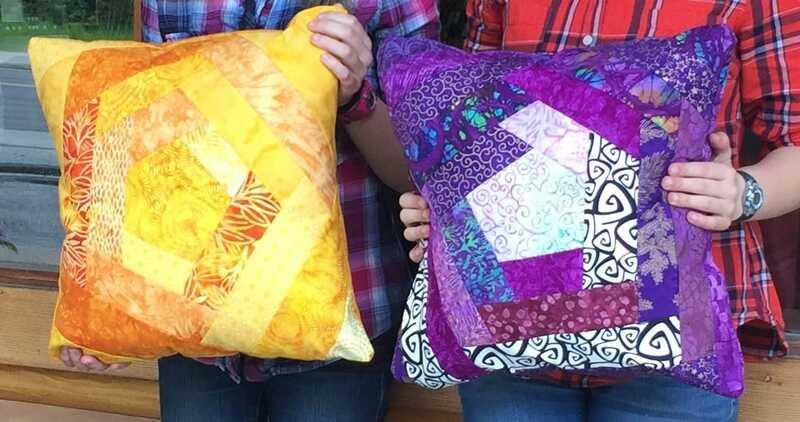 These pillows are a fun and easy introduction to quilting! Open to anyone 13 and up, will consider younger if an adult comes to help, or if they already have some sewing experience. 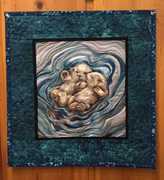 In this class we will learn the basics of free motion quilting, then learn and practice several designs. No actual project will be made. In this class we will make one of my wall hanging designs. They all use a similar process, so you can choose which one you want.